SUITE X has a brand new, modern and intuitive user interface. It reflects current design styling, supports state of the art high-resolution screens (High DPI) and multi-display technology. The software also sets new standards in user-experience and ergonomics. 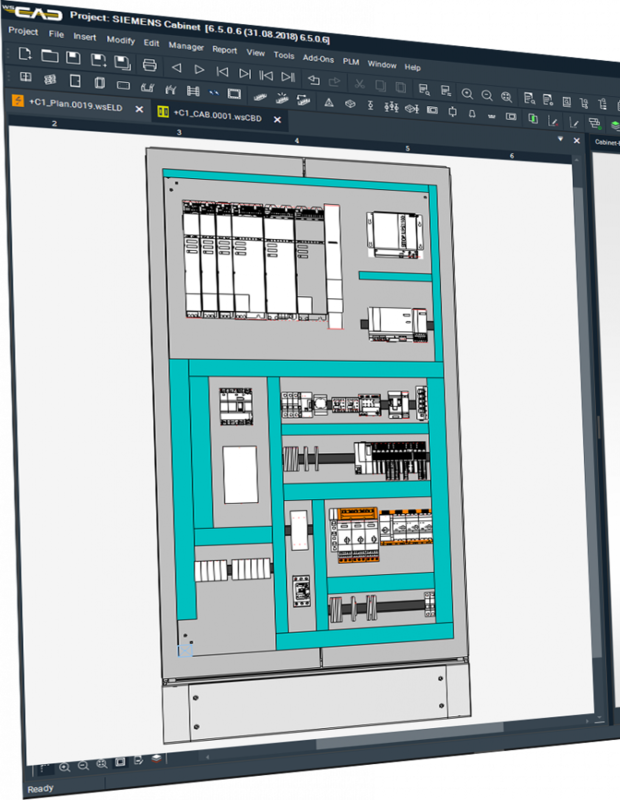 Its simple, intuitive interface also helps occasional users of Electrical CAD to work effectively. SUITE X can be optimised for efficiency with just a few settings. There is no need for a special systems administrator. The WSCAD SUITE X is supplied with a wealth of symbols and article data. You can find 1.3 million data records from more than 210 manufacturers in WSCAD, Eplan* and 3D-Step format online at wscaduniverse.com. Always up-to-date and above all free of charge – including lightning-fast search algorithms and easy import. Hosting is free for manufacturers which is why wscaduniverse.com has quickly become the world‘s largest Electrical CAD database. And it’s forecast to continue growing. If you require specific article data, it’s quick and easy to create. If you don‘t have the time, our specialists can do it for you. While use of the software is simple, it has an impressive array of functions. Schematics, cabinet layout, piping & instrumentation diagrams (P&ID), flow diagrams, building and room automation and all electrical installations – all integrated on a single platform. This saves huge amounts of time and helps prevent accidental errors. Despite its extensive functional range SUITE X generally costs 60% less than other comparable solutions on the market. This cost benefit is also reflected in the annual maintenance costs. Compare for yourself! WSCAD has focussed on developing the application’s speed and performance. Projects with more than 1,000 pages are opened at lightning speed. Create a PLC in an instant. Terminal management is child‘s play and full documentation can be exported over 10 times faster than in previous versions. WSCAD customers just get their work done quicker. As consistent data is a company‘s capital, we help you to create Digital Twins and to digitize your engineering data in SUITE X. The WSCAD solution interfaces with numerous other Electrical CAD applications as well as with your IT and production systems. Data can be easily imported and exported. Connection to the PLM and ERP systems of well known manufacturers and mechatronic part lists provide transparency within the overall development processes. You can use the data produced with WSCAD SUITE immediately and without additional costs. You are then all set for the production of wires, wiring kits, mounting plates and cabinet doors from service providers or on in-house NC centers from well-known manufacturers. A highlight of the WSCAD SUITE X is the WSCAD AR App which has two functions. Repair and service engineers can scan field devices and components in the cabinet via smartphone and get immediate access to the schematics – including references, 3D component views, full article data and original manufacturers’ datasheets. The latest function is the Active Wiring List. The fitter marks the connections as soon as they have been wired and saves the latest version. An analysis function guarantees that nothing has been forgotten. The App can be downloaded free from the App Store and Google Play. WSCAD SUITE X enables you to automate repetitive processes and routine tasks. Templates and design models provide reliability, save time and create a unified company-wide standard. Diagrams can be automatically generated from part-circuits at the press of a button. Full schematics can be produced using product configurators without the need for an electrical engineer. The design process can be reduced from several days to a few minutes. Whether you require new functions or more workplaces, the WSCAD solution is modular and scalable. It grows with you, without the costs of new equipment or data interruptions. Simply activate your product key and use the expansion straight away. The system’s highly developed, clear structure, means that tailored software expansions are also possible. Tell us what you need and we will find a way to integrate your additional requirements.